Wallace Rocha, right, looks on as Brazil's Philippe Coutinho appears on screen during the playing of Brazil's national anthem before the match against Costa Rica on June 22. Wallace de Oliveira Rocha dreamed of owning an official Brazil national team jersey ahead of the 2018 World Cup. But at $250 Reals ($66 USD), the 12-year-old from Vila Cruzeiro, a favela north of Rio de Janeiro, knew it was a long shot for his poverty-stricken family to afford. Hours before the Brazilian team stepped on the field at Rostov Arena in Rostov-on-Don, Russia, for their premiere game against Switzerland, Rocha’s mom, Sandra Rocha, took her youngest of five children to a local seamstress in their shantytown and asked if she could help, according to a local photographer who shared the family's story with NBC. "Tia Neuza" (Auntie Neuza), as she is affectionately known among residents in the Penha neighborhood, grabbed a piece of yellow fabric and sat at her sewing machine. She fashioned a sleeveless tank with green trimmings and charged them $10 Reals ($2.75 USD) — another bill Sandra would have to pay on credit. For Brazil’s second game against Costa Rica on June 22, Wallace wanted to personalize his "jersey." His mother had suggested he use his name, but Wallace already had one in mind: Philippe Coutinho. Tia Neuza used a green marker to write "Coutinho" and "11," the attacker's national squad number, on the shirt. Wallace, donning his makeshift jersey, and his cousin made their way to a free viewing party for the match where locals were projecting the game on a large screen outside on the street. The young fan was then captured in a photo by Brazilian photographer Bruno Itan. Coutinho scored the first of Brazil's two goals in that game, beating Costa Rica 2-1. Itan didn’t speak to Wallace that day. To the photographer from the notorious Alemão favela, Rio’s largest and one of the most dangerous, Wallace was just another subject in his effort to capture how residents in Rio’s slums cheer on the Seleção. After posting the photo on his Instagram page, one of several he added that day, the image of a young, poor boy gazing at his idol while wearing a DIY shirt bearing his name garnered thousands of likes and over a hundred comments in 24 hours. Many users tagged Coutinho in the hopes that the soccer star would see the photo. The response gave Itan an idea: he was going to find a way to connect the boy and the Brazilian ace. Itan returned to Vila Cruzeiro the next day and tracked down Wallace. He then launched a social media campaign, asking users to share the photo with the hashtag #Wallace11 and to tag Coutinho. “I want this photo to reach Philippe Coutinho so that he can see what an inspiration he is to kids in the favelas and to send a motivational message to Wallace, or who knows, maybe an autographed jersey,” Itan wrote in the post. Within four hours the photo had traveled 10,000 miles across the world and reached Coutinho in Moscow. "I got the photo! I sent you a private message, please respond when you can," Coutinho commented in Itan’s post. Itan told NBC Coutinho plans on meeting Wallace when he returns to Brazil after the World Cup. And despite being busy training for last Wednesday’s match against Serbia, Coutinho took a moment to thank the young fan for his support in a recorded a video message. The photographer shared the video with Wallace Tuesday during a surprise visit to the Rocha family's home. "He was quiet, pensive, trying to take it all in. I don't think he could believe that one of the best players in the world, his idol since Coutinho played for Liverpool, made a video for him, a kid from the slums," Itan recalled to NBC. And that wasn’t the only gift Itan came bearing. A stranger who saw the Instagram post donated an official team jersey for Wallace. Wallace Rocha, left, and Bruno Itan. The Rochas live in a one-room shack, Itan said. Wallace's mother is unemployed and his stepfather is the sole breadwinner. They have a television, but no cable or internet. Wallace told Itan the neighbor lets him use her WI-FI to stream videos of Coutinho playing. Asked what teams the 26-year-old midfielder has played for, according to Itan, Wallace didn't hesitate to recite Coutinho's soccer biography. Wallace is also a soccer player. The self-proclaimed ace spends his Saturdays at the Vila Cruzeiro's Vacaria field playing with two different soccer groups. His dream is to play for Rio's Vasco da Gama junior league, following in the footsteps of his idol. He hopes to eventually be good enough to play for a major professional team so he could buy his mom a house. "His family is very poor. I really hope this changes his life and theirs," Itan said. Wallace's mom told Brazil's OGlobo in an interview Sunday that she has not yet paid Tia Neuza, whose real name is Neuza Teresa, for the shirt the seamstress made, "but God willing we will be able to do so soon." Meanwhile, Wallace has a second official team jersey en route to his home in Rio. Coutinho sent Wallace an autographed jersey over the weekend and asked the boy to wear it for the duration of the World Cup in support of the national team, OGlobo reported. 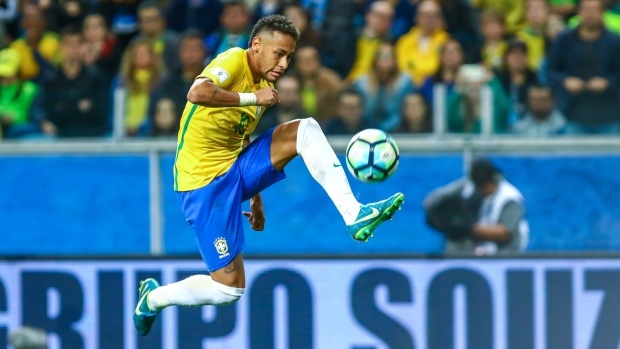 On Monday, Brazil secured a spot in the quarterfinals by defeating Mexico 2-0. Wallace told OGlobo that he feels like his makeshift jersey is the actual lucky jersey that has brought the team success. "I'm going to wait until after the World Cup to try it on. I'm going to continue wearing this one," Wallace said.